Word. Who was it who said all you needed were a few fresh, simple ingredients to create a truly stunning meal first? Alice Waters? Seems about right. I’ll add to that by saying that you only need a small amount of basic kitchen equipment to turn out surprising results. 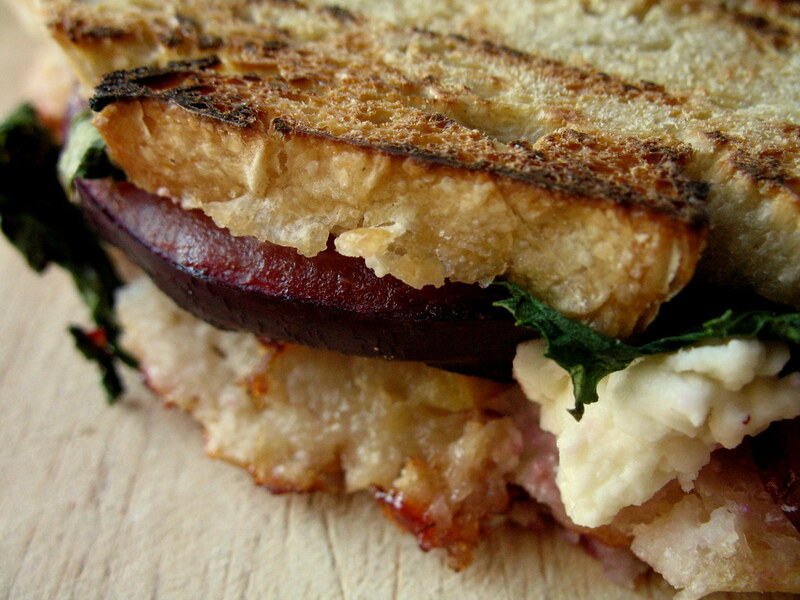 Like this panini — no need for specific gadgetry. If you have a heavy pot or pan and another one, you can do this. Here, I’ll show how. First, plums are popping out of the orchards this time of year, in different flowery shades. 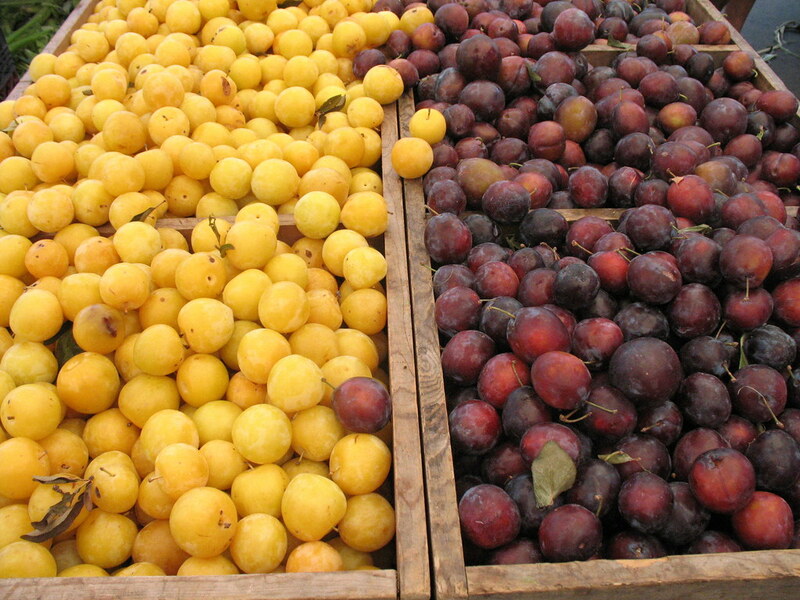 Don’t wait to plummet your local Greenmarket as it’s now or next summer for these stone fruit. No-Knead Bread loves to be panini-pressed. I No it from experience. 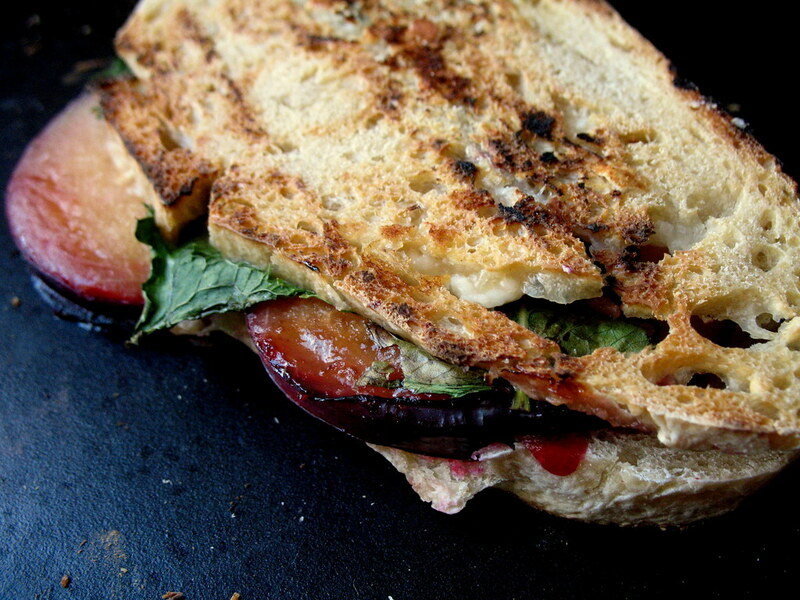 Salty and sweet becomes really salty and mildly sweet with feta and black plums. Works for me. Add some fresh mint leaves and there’s also refreshment that’ll have the Orbitz gum commercial lady smiling in approval. Then we do the pressing. Get your stove fired high on two burners and place one heavy-bottomed pan (or pot) on each. Slap your sandwich down on one of them, open-face, and wait a couple minutes. Then, close the sandwich up and place the other pan on top of it. There’s going to be some sizzle. And if you didn’t oil the bread or the bottom of the pans first like me, there might be some sticking, too. Since my bread was a little holy (no, not in that way), it let the cheese ooze through and when I lifted up the Dutch oven the top half of the sandwich wanted to stay there. Not a big problem — it came off with a little nudge of a spatula. But it can and should be avoided. Or maybe not, since the burnt little crusty crusts of feta proved the most enticing parts of the meal. And those jammy, red stain-worthy plum pieces weren’t bad, either. I forgot to use a plate for this one. I think I also ate it standing up. The end. Now I’m going to leave off here saying that next week I’m totally going to be spending every waking minute working toward a certain deadline of a certain project. So I’ll be back with that Highbrow BBQ recipe and recap soon afterward, as well as the 24th Reason For Not Eating Out. And you know what that means? 24 reasons of the month, and 12 months in a year?… See you in September! Heat a sautee or frying pan over a high flame. On another burner, heat a heavy, preferably cast-iron pot or pan that will fit on top of the other pan with a sandwich in between, also on high. 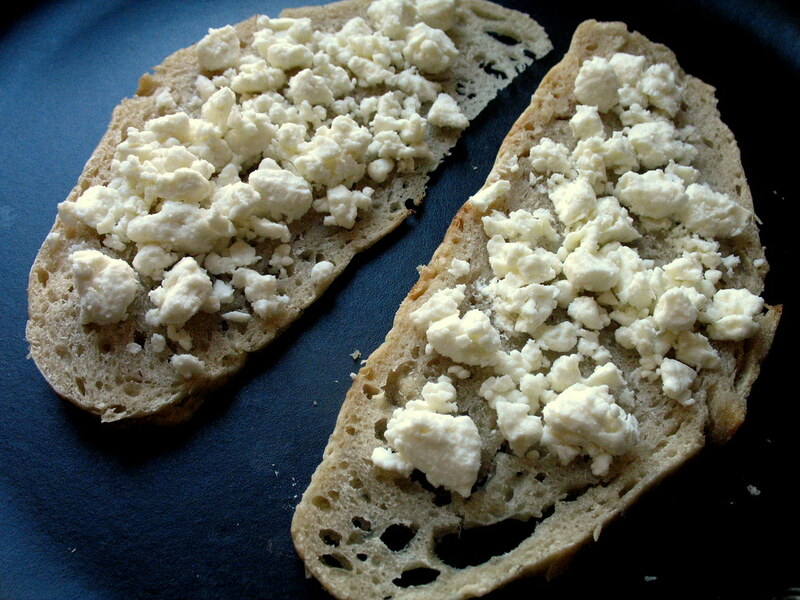 Place the bread on the first pan, and arrange the feta evenly on both pieces. 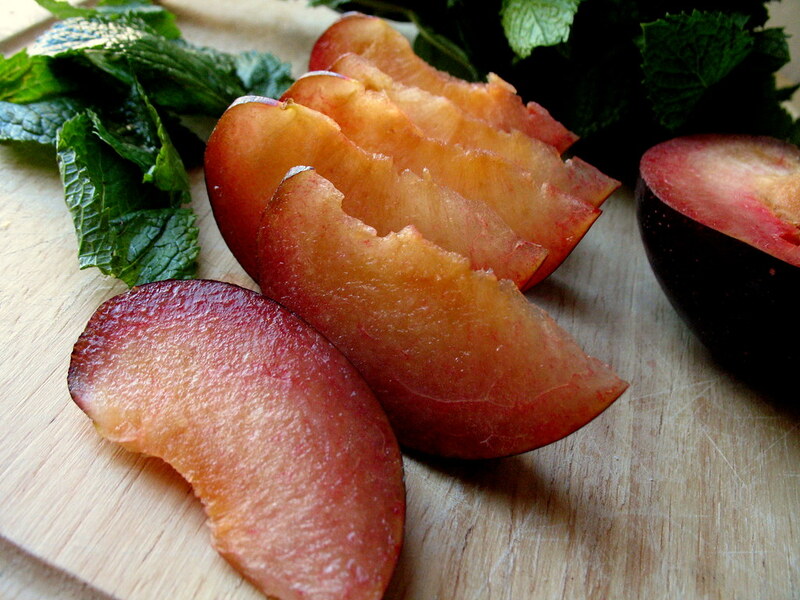 Arrange the plum slices on top of one piece, topped with the mint and optional black pepper. Let cook 2-3 minutes, until the feta looks like it’s starting to melt a little. Reduce heat if you smell any burning, or turn it off completely. Carefully close the sandwich. Brush the top of the sandwich with some olive oil (to prevent sticking). Lift the heavy pan and place it on top of the sandwich. Cook another minute or so. 2 slices homemade No-Knead Bread: $0.10? Three brownie points: Attack those black plums! Deep color betrays deeply nurturing antioxidants, surpassed only by blueberries and cranberries (attack them, too, when in season). 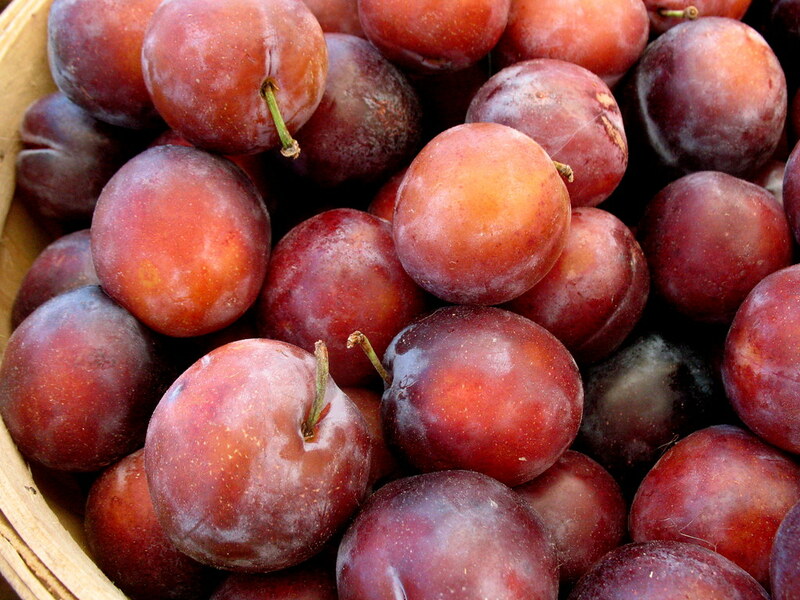 Apparently plums also promote better iron absorption and help prevent macular degeneration, too. They’re also high in Vitamin C, improve digestion and may help prevent cancer and heart disease. Repeat: attack! Plummet! Okay, you get the point already. Use an abundance of fresh mint for the most leafy greens nutrition (and cooling sensation). And I like the fact that low-fat feta seems to be commonly produced these days. My pack of crumbles says they have less than 5 grams of fat for a 1/4 cup. 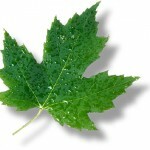 Six maple leaves: The other thing I love about cooking with only three or four ingredients is that it’s so easy to keep tabs on where your stuff came from. Truth be told, the mint didn’t come from the Greenmarket, since I didn’t have the foresight to purchase a bunch when I was there, but the plums did. The bread I made at home. Only gray area here is the feta, which I love. Mine was the popular brand Athenos, which I’d picked up at a normal grocery store, and it’s produced in the States at least. Yum! Last summer I made open faced plum sandwiches–toasted bread topped with roasted plums, fresh ricotta, arugula tossed with a balsamic vinagrette and topped with a few slices of proscuitto. Delish! This looks great1 I love panini with fruit. I have a peach, prosciutto, and goat cheese version that’s amazing; thanks for reminding me to make it (after I try this plum one, of course!). Wait a minute, proscuitto? You guys are genius!! Erin, I’m making your version next. Then Christina’s. Amen. What a great idea to use a heavy pot to make paninis! No need to buy a fancy schmancy panini press that never gets used and takes up space. Love it. Thanks for another great post! I always enjoy checking out your blog. In fact I nominated it for a Brillante award at my own blog. Enjoy! That looks really good, I’m glad I have a surplus of mint…. oh that looks so good. I’m all about pressed sandwiches right now. I wouldn’t have thought to mix those flavors but it sounds delicious. Oh. My. Gawd. That looks superb. 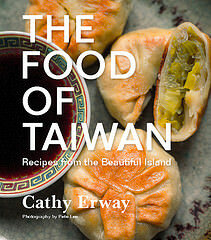 I love the photo of your dutch oven on top of the sammy–great illustration! I actually have a brick that I keep in the kitchen (covered in foil when using, of course) for just this purpose. Yum, now I want a pannini! I made one of these over the weekend. I was pleasantly surprised by the results. I might try again, substituting chevre for the feta, which I can get more locally sourced. I’m not sure why, but all the feta I could find was from Europe. Uach.. that´s not for me, looks as if a car went over it ! 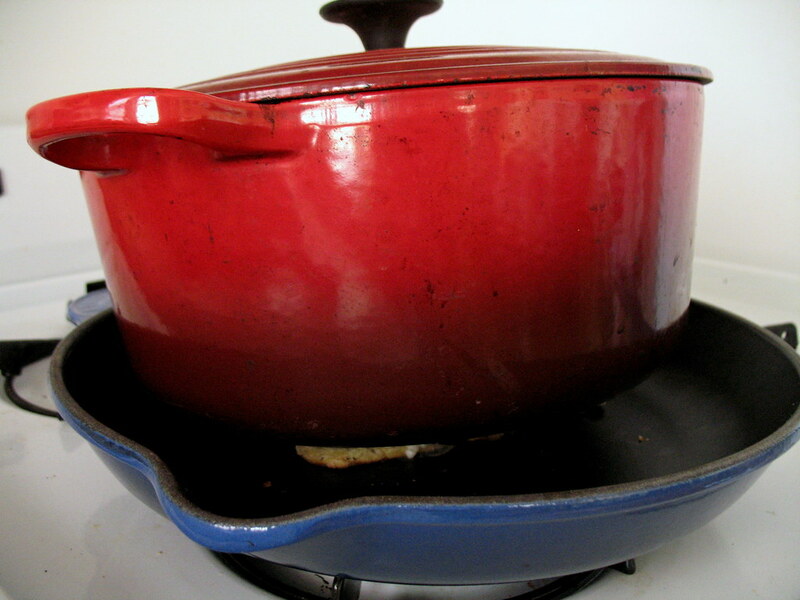 Cool – I never thought about using my cast iron as a panini press before – cheers for the tip! 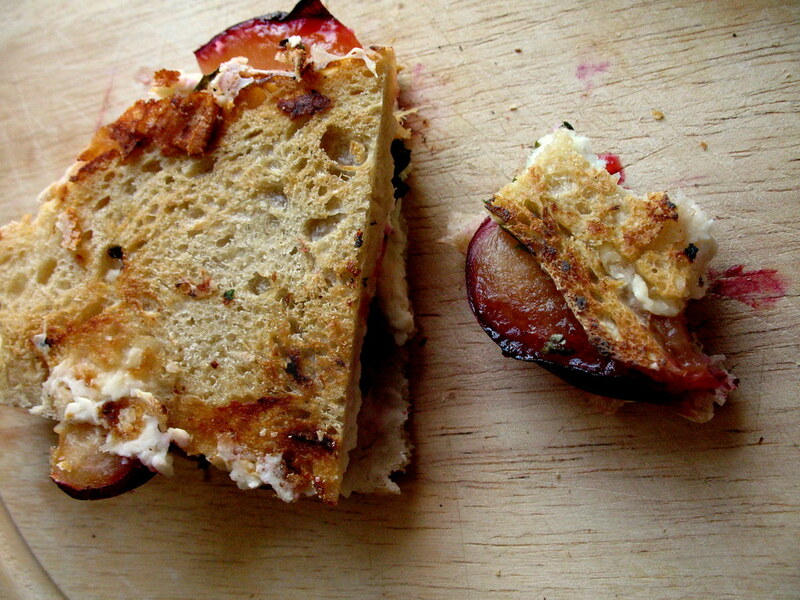 made this last summer and found some yummy plums, so it will be lunch for today!! 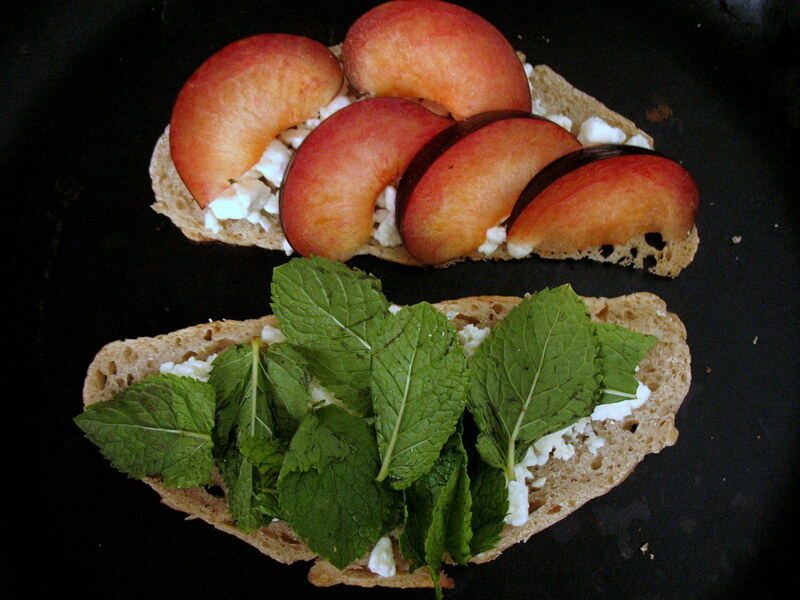 picked the mint from my plant this morning and got a demi baguette & feta from TJ’s yesterday. Have coconut oil and a George Foreman grill here at work so I’m eagerly awaiting lunchtime today! !